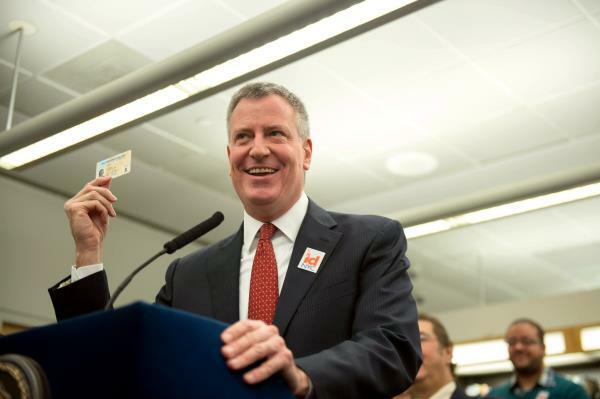 New York City Mayor Bill de Blasio just announced a municipal identification card program which offers all residents regardless of immigration status a form of ID that is valid for interactions with city government and law enforcement agencies. The card will be accepted as valid primary identification at some city banks and credit unions, city government buildings, schools and hospitals that require photo ID. Supporters of the program believe it will serve as a model for other cities and states to improve the quality of life of its residents. Opponents counter that it will promote identity theft and encourage more illegal immigration. The IDNYC program – as it is called – doesn’t grant card holders residency status or access to federal or state benefits. Only the federal government can confer immigration status to people entering in or residing in the United States. But the new cards will enable residents to obtain driver’s licenses and set up bank accounts with some institutions. And it will provide some popular benefits such as free access to city museums and grocery store discounts. New York City is not the first municipality to offer such cards to citizens. Other U.S. cities, including San Francisco, Los Angeles, Washington, D.C., and New Haven, Connecticut, which was the first city to start an ID program, according to the American Immigration Lawyers Association, have created similar ID programs. But, because of the size of New York City, this program may have the largest impact. It is estimated that hundreds of thousands of New Yorkers will be able to take advantage of the new cards. The Shulman Law Group endeavors to ensure its clients be kept abreast of all significant developments relating to the process of naturalization to the United States. Edward Shulman, Esq, founder of The Shulman Law Group, LLC is a national speaker for the American Immigration Lawyers Association (AILA). AILA is the national association of immigration lawyers established to promote justice, advocate for fair and reasonable immigration law and policy, and to advance the quality of immigration and nationality law and practice. In the course of Mr. Shulman’s involvement with AILA, he has been dedicated to educating other immigration attorneys about the import of helping intending immigrants to navigate a new cultural system. He meticulously follows all of the developments occurring in the battle over immigration reform so that he will be prepared to effectively assist his clients obtain residency and legal work status if a new system is enacted.